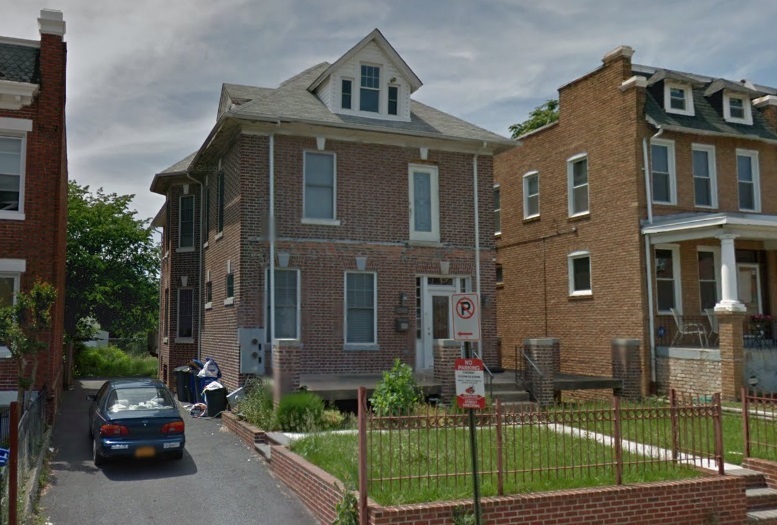 3542 Warder Street to Become 13-Unit Building | Park View, D.C.
3542 Warder Street in April 2014. 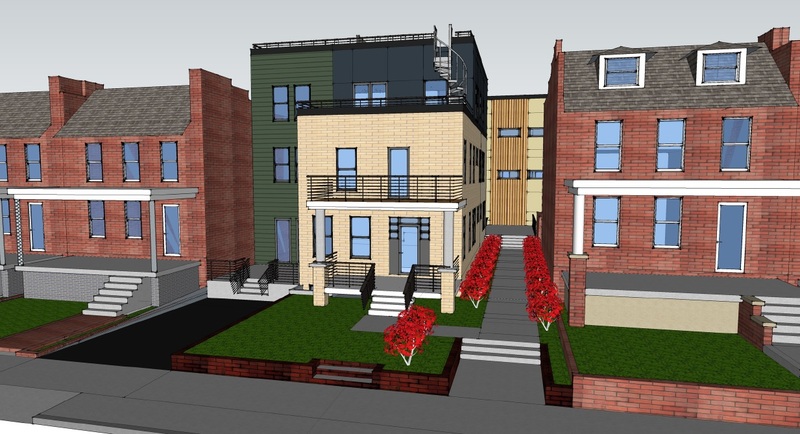 The Neighborhood Development Company is gearing up to redevelop the property at 3542 Warder Street, NW. NDC already has the the building permit and are scheduled to start demolition on or about April 27th. Once completed, the project will contain 13 new living units. One unit will be a three-bedroom unit, with the remaining 12 units consisting of two-units options. A certain number of the two-bedroom units will also contain a den, though the exact number is currently unknown. In April 2014, the plan was to convert the property into a 12-unit building. At that time, the developer was planning for the structure to abut the property to the north, which would have covered their southern windows. Before this project got off the ground, the property was sold to the current owner on March 3, 2015, for $2,150,000. Update (8:48 am): The development includes 7 off street parking spaces. The renderings below give an impression of what the finished project will look like in general (although some details are still not final). This entry was posted on April 22, 2015 at 7:01 am and is filed under Development, Housing. You can subscribe via RSS 2.0 feed to this post's comments. It doesn’t look like there is any parking? That can’t possibly be right…. The development includes 7 off street parking spaces. 7 is still not enough, especially on Warder. This neighborhood is going to be like Perry street between 16th and 14th…. Do you realize how much the city subsidizes a street parking space? A street parking space takes up about 200 square feet of land. The market value of 200 square feet of urban land is not the $35.00/year that D.C. charges. It’s even insane to force developers to put parking in their buildings just so people have extremely easy access to an already publicly subsidized good. Do you realize how much citizens pay in property taxes, impact fees, gas & transpiration tax, and income taxes? I expect a city that costs as much as DC to be easy to live in and provide the same amenities as other cities across the country. Nothing is subsidized…unless you don’t work. Keep in mind metro is a money looser if you take away “subsidies”, but its also necessary for quality of life, like parking. An aside: Metro created untold billions more in real estate wealth and long-term property tax receipts than it ever costs to build and operate the system. 28 percent of the DC area’s real estate value sits on the 4 percent of the region’s land area within a half-mile of metro stations. That’s untold billions in long time tax receipts and real value created by the mere presence of an underground heavy rail line. Operating costs aside. No, we need to assume that people will own cars in our planning processes just to make it easy for you to park indefinitely. Good attitude! Now, please explain why developers should be able to gobble up our subsidized public resource for higher profit? (And don’t tell me I just want to hog all the free parking for myself: I do have off-street parking, which I made sure to maintain during recent renovations. It takes up a good portion of my back yard and prevents me from having a decent lawn for my kids). From what I understand, the parking spaces will be on the back side of the building section that will sit in what’s now an empty lot in the alley. 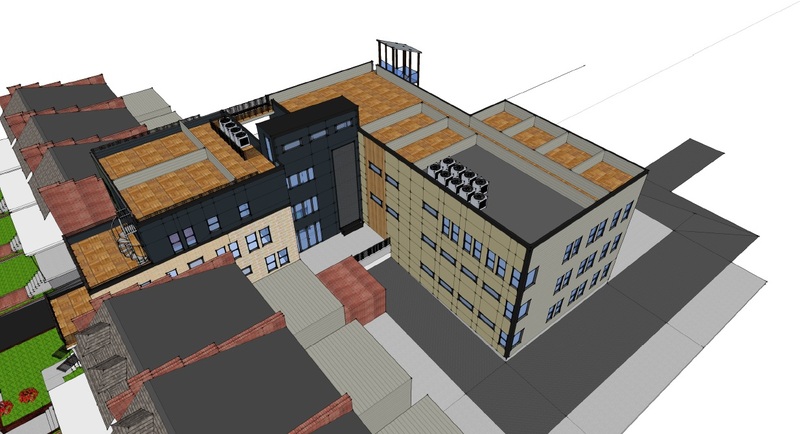 You can see a portion of the parking area in the second drawing to the far right (light gray triangle behind the building and left of the alley roadway. It looks like the building will come right up to the alley – we’ll feel rather closed in after all these years with an empty lot behind us! That’s ok, of course, though the building will block our view of many trees and sunsets. Ahh, progress…always a mixed bag. A number of us live here without owning a car so hopefully, some portion of the future residents also will take advantage of all the metro options (busses and train) and car sharing services. Fingers crossed. I wish it had zero parking spaces and more living units. Yikes, 7 parking spaces for 13 units? Did they get a variance for that? If so, I wish we’d had the opportunity to oppose it. Serious question: Would you mandatory-parking types be assuaged if the city created a formal legal process where developers could skip parking but would also ban people living at that address from getting a RPP street permit? I suspect a lot of developers would take that bargain and that all those units would be rented with no problem. Not everyone needs to own a car and lots of people don’t and there doesn’t seem to me to be any reason to assume car ownership in planning. I don’t know what you mean by “mandatory parking” types. There are a lot of gals assumptions in your response. I like your idea though, but I don’t think developers would because parking and cars are a necessary amenity, even in a city. Developers prefer the current set up where existing residents suffer the impact. I do think that’s the only solution, as long as subsequent purchasers of the condos/renters of the apartments can’t appeal the decision a few years later. I’ve read some odd complaints by tenants in that type of new constructions clamoring not to be “treated like second-class residents” by being denied an RPP. Maybe if such a system is formalized and more frequently used, such misunderstandings would dissipate. And I agree with Cliff that the developers would balk. That’s only because they can currently get away with products like the one posted here, though. Byron, you are frequently pretty much the only voice on your “side” of these discussions, and often the loudest voice in the discussion, so I’ve taken to frequently ignore your posts, but I’ll tentatively agree with you here. There was recently a variance granted on that basis (corner of GA and Princeton). Theoretically this could be a solution, but It remains to be seen whether it can actually be enforced. I also thought of this idea, some time back, and I love it. I tell it to people all the time, and they usually think it can’t happen or that it would deter development, but I disagree. Im glad to here this idea is starting to be used. Is this development by right or are they seeking a variance from the zoning commission? Without judging good or bad, the amount of parking does seem low in comparison to what I thought were current zoning rules. I think I answered my own question. Looks like, according to current rules, the building is probably required to have 1 spot for every 3 units. Regardless of what one thinks of the density/parking issue, this is an ugly building – what a disappointment (especially for those of us living in the immediate vicinity). Also, it looks like the residents will have to access the parking spots via the alley, the entrance to which is on the short block of newton between 6th and Warder, which itself isn’t the best for car traffic. This reminds me of the discussion in the comments on Kent’s post on 511 Kenyon – developers beginning to use alleys in ways they were not really built to withstand…. All of the parking spots do abut an alley, just like almost every other parking spot in the area, but as per the plans filed at dc, all of the tenants have entrance & access through the building on Warder st. Regarding parking, making each unit have it’s own parking space in an urban apartment or condo building is insane. It would just encourage more cars in the city. I drive by this house often, & there is never a morning, day, or night without extra parking. I am sure all of the single-family home owners who are complaining about increased parking load from developments like this, are also liking & using all of the new restaurants, bars, grocery stores, etc that are coming to the neighborhood in large part to these new developments. Can’t have it both ways folks. Also, every urban planner hails urban density as a good thing. More amenities, safer streets, etc. Would you rather a bunch more apartment/condo buildings be built 30-45 miles outside of town? Now that would increase parking load in the city. As far as aesthetics, enh! If u want a pristine historic neighborhood where everything looks the way it did when built 100 years ago, move to a historic neighborhood! I actually think the new building looks quite nice, as modern buildings go. The porch is a nice nod to the federalist style of row houses in our area, and there are already several similar buildings on Warder across from the school, so it’s in good company. Neighbors should also be grateful that the developers decided not to fill the full lot and have allowed space so that neighbors on either side can maintain access to light and air for their windows. Grateful? They obtained a variance so that they could use more of the lot than they should have. We should be irritated at DCRA that they granted a variance to use more of the lot than the developers should have, not grateful that the developers didn’t use up even more! At this point, Park View doesn’t benefit from variances granted to developers, does it? Its residents suffer and the developers profit. While we’re expending so much energy looking to create new rules against pop-ups, we should, at the very least, oppose variances on lot occupancy and parking spots! Refusing lot occupancy and parking spots variances in Park View side streets might give the neighborhood a chance to keep its single-family homes, which are in huge demand, and which maintain our neighborhood’s character, and might redirect some of the development to Georgia Ave, which needs it. I’m chiming in a little late but just wanted to let you know that the developers wanted to build right up and take the windows of both neighboring properties but the building plans were rejected for demolishing too much of the existing structure. I’m not really sure the neighbors have any reason to be “grateful” to the developers who did not redesign that way out of the kindness of their heart. Maybe to the zoning commission for actually not allowing a variance on that one, even though they did let them squeeze in the extra unit. As far as i can tell, this developer did not max out their lot occupancy, & any extra sf was for affordable housing, so no benefit to developer really. Just DC’s way of getting affordable housing increased & mixed into neighborhoods. Building to lot line is legal, windows along property line are illegal. If any new project is blocking windows, then those windows where illegal to begin with.